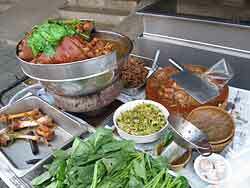 Readers of this blog know of our love of markets and street food. 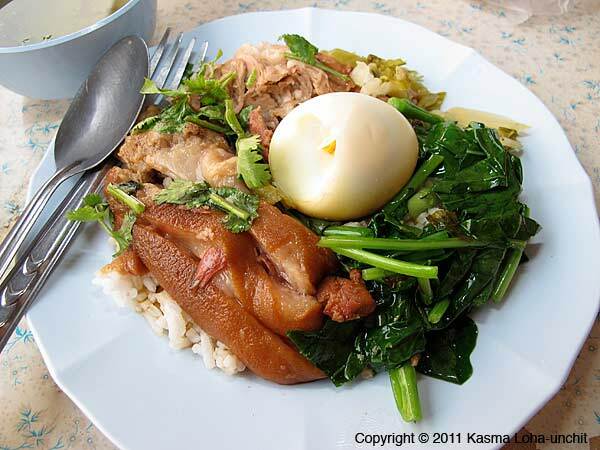 Certain foods are more widely available on the street and one of the dishes that I especially love is Stewed Pork Leg Rice – Kao Ka Moo,. 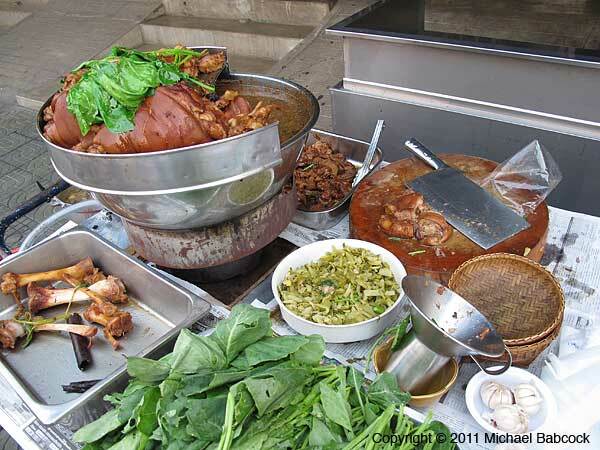 A recent Thai cook book categorized this as a Chinatown food – interestingly, I’ve seen it on streets all over Bangkok and Thailand but never come across it in Chinatown. How could we pass this by? 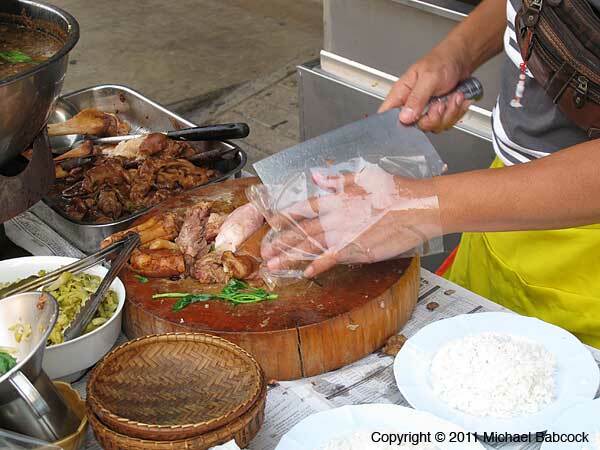 Although we sometimes make this at home, to do it right you need a pork leg with skin on, and a single recipe makes quite a large quantity. The skin is what really makes this dish so delicious: with the skin on, the dish contains lean meat from the leg muscle combined with the rich, fatty, gelatinous skin and fat. It’s not hard to make: you essentially stew the pork leg with spices until it’s nearly falling off the bone with tenderness. Add some pickled mustard greens, hard-boiled duck eggs and then serve over rice with a hot and sour sauce and blanched Asian broccoli on the side. 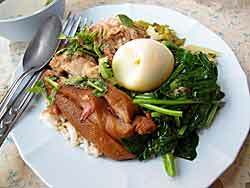 Usual cost is about 30 to 40 baht for a fairly substantial plate of succulent, delicious food. 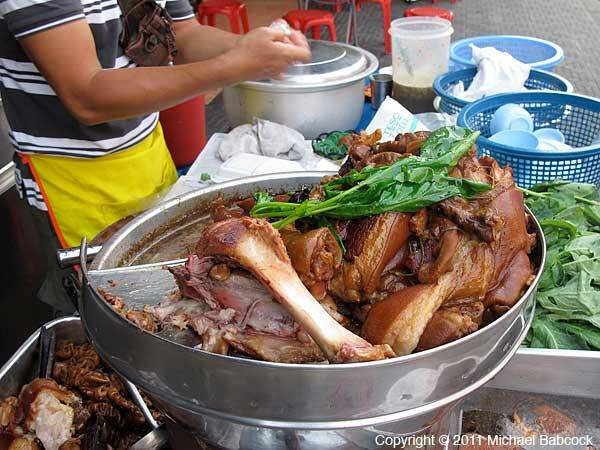 There used to be a pork leg rice vendor right outside our hotel an Sukhumvit Soi 55, where I could easily satisfy my craving. 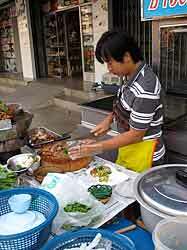 Unfortunately, she now makes blended drinks and I’ve not found another nearby pork leg rice vendor, yet. This past January we were headed down south to do some snorkeling and decided to stay overnight in Hua Hin, a sea coast town on the east coast (Gulf of Thailand) about 200 kilometers from Bangkok. It’s one of the closest resort towns to Bangkok. About 25 kilometers north is Cha Am. Cha Am has always been more of a resort for Thais and Hua Hin is more popular with fahrangs (Thai word for Caucasians). Years ago we had really enjoyed the night market at Hua Hin and, since we didn’t want to miss the morning market (Chat Chai Market) either, we decided to stay overnight. We found a hotel about two blocks from the morning market on Thanon Sasong (Sasong Road). The next morning as we walked to the market, about a half a block from the hotel we spied a street vendor selling pork leg rice from a cart and, both having an immediate Pavlovian response, walked over in wordless agreement. We both love pork leg rice; we love the richness of the dish, the lovely feel of varying textures in the mouth (from the lean meat, the fat and the skin). 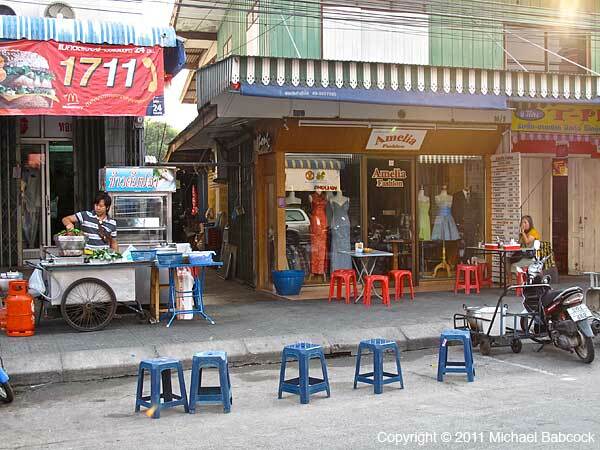 This is a fairly typical street set-up that you see all over Thailand. He has a cart on wheels so he can move it on and off the streets along with a couple of (flimsy, metal) tables to hold everything else he needs. Heat is provided by a canister of gas. Seating is provided for customers by incredibly flimsy plastic stools and metal tables. Everything can be packed up and carted away in short order. The dish was every bit as delicious as we expected. 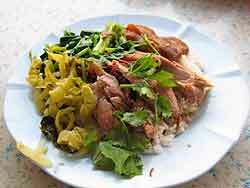 The pork was rich and tender while the pickled mustard green added a slightly sour counterpart. It was also served with a light broth with melon in it – good for clearing the taste buds after the rich pork. If you are in Hua Hin and want to try to find this vendor, here’s how to do it. As you are heading South on Highway 4 (Thanon Phetkasem), you’ll drive past Chat Chai Market (the morning market) on your right. 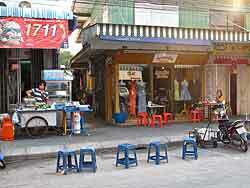 The southernmost boundary of the market is Thanon Dechanuchit (Dechanuchit Street) – turn right there. Go down one block to Thanon Sasong (Sasong Road) – turn left there. Almost immediately on your left is a 7-11 store: the food stand was directly next to the 7-11 store. Be warned, though, street food vendors do come and go. For information on Hua Hin, check out Thailand Hua Hin dot com. It comes complete with maps and photos of many attractions. There are restaurants that serve pork leg as one of their dishes. It’s usually served as one of many dishes, without the pickled mustard. 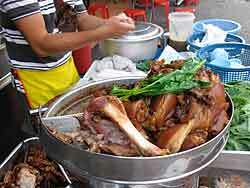 Here’s a picture of Stewed Pork Leg served in a restaurant in Northern Thailand. We’ve also come across deep-fried pork leg, a particularly tasty treat. Great chocolate is not something most people associate with Thailand, but I recently found some at a store called Melt Me. Over the years, there’s been an increase in the availability of many Western foods, including baked goods and western fast food chains. Coffee stands are now found almost everywhere – at gas stations, in markets and in coffeehouses; you find coffee in western chains, Thai chains and small street stalls. When I started traveling to Thailand (in fall 1992) there was virtually no chocolate available. Occasionally I’d come across a Lindt bar in a store somewhere; the bar invariably turned out to be somewhat chalky, old and flavorless. 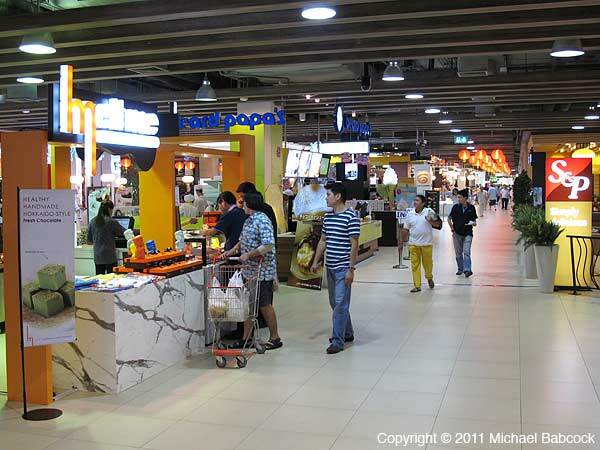 When we are in Bangkok, we often go to malls to shop or to eat. One of the advantages malls is that they are air-conditioned: in perennially hot and humid Bangkok this is no small thing! Thai malls are significantly more lively than malls in the United States. Of course they usually have a large department store or two, many chain restaurants and stores, as well as Thai businesses selling anything you can imagine. Unlike U.S. malls, with their wide, empty, sterile, aisles, though, most malls also have less formal stands, reminiscent of market stalls, in many of the aisles: it’s a bit like a street market inside the mall. 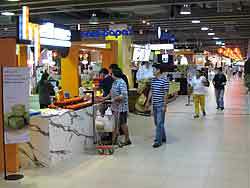 In addition to store-front restaurants, they include a food center, which is much like street food brought indoors. On our recent trip to Thailand we made an excursion to Paradise Park to buy some moringa oil and have lunch. We were heading to one of our favorite stalls, which sells passion fruit juice. As we were walking down the aisle I spied an interesting sign: Melt Me. We walked over and were offered tastings of three different chocolate products: a chocolate called Hokkaido dark, chocolate covered macadamia nuts and a green-tea/chocolate confection called Hokkaido Matcha). 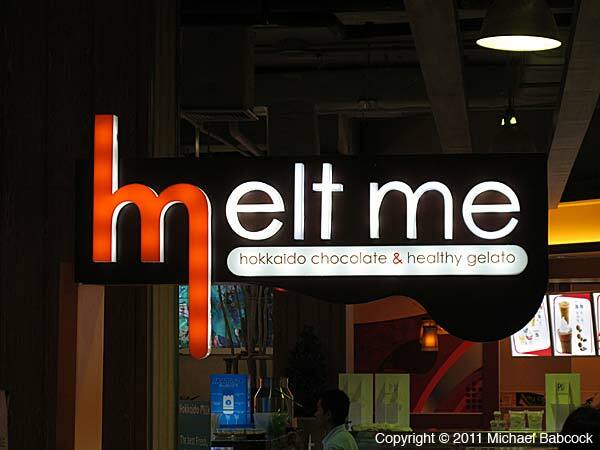 Update Note, March 2013: Unfortunately, Melt Me no longer has an outlet in Paradise Park. 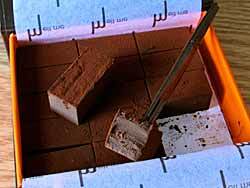 Please see our new blog on Melt Me Chocolate, Revisited. The rest of this blog is still accurate. 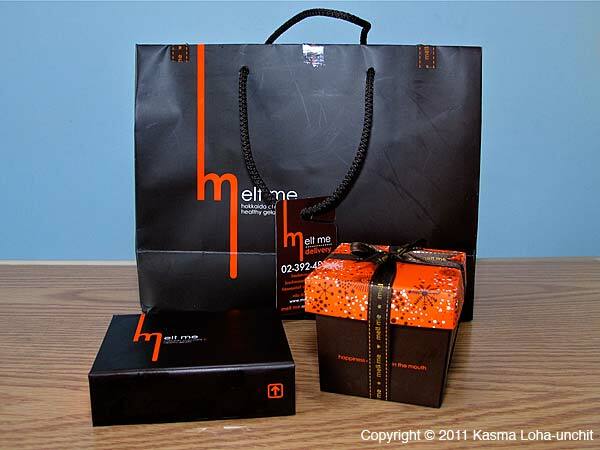 Tasting the Hokkaido dark chocolate, it was obvious where the name “Melt Me” comes from. 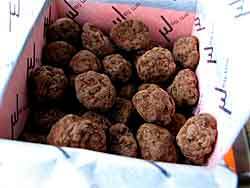 The dark chocolate is rich, creamy and bittersweet, almost like a truffle in its consistency; it does, literally, melt in your mouth. It’s a luxurious confection: rich and tasty. It reminds me of a house truffle that a (now gone) store called Cocolat in Berkeley used to make: I could never get enough of those truffles. We immediately bought a box of 15. It wasn’t cheap: 270 baht (about $9.00 at the time), so 18 baht (60 cents) a piece. One nice thing about this dark chocolate is that it is very satisfying in small quantities: after one or two pieces, I was satisfied for the time. They are very rich. The chocolate-covered macadamia nuts were another treat. They use lightly roasted macadamia nuts and have wisely used partial nuts rather than whole nuts: the balance between chocolate and nut is great – neither one overwhelms the other. A box cost 350 baht, about $12.00 at 30 baht to the dollar. I found the Hokkaido Matcha, chocolate and green tea, not very interesting. One reason their chocolates are so good is because they are kept at a low temperature. Instructions say to keep them at 1 to 4 degrees centigrade, so they need to be refrigerated. When you purchase them, they are put in an elegant carry bag complete with a package of dry ice, to keep them cool until you get home. 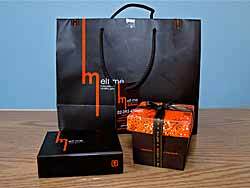 The name “Hokkaido chocolate” refers to a Japanese-type of chocolate: the company is Thai-owned and operated. I highly recommend their Hokkaido dark chocolate and the chocolate covered macadamia nuts. If you can get to Paradise Park, plan on having lunch there: the food center has lots of delicious options. It might be easier to go to the Melt Me shop on Thong Lo Soi 10. They also have gelato there, which would certainly be worth a try. Here’s the address: 1st floor, @ Arena 10 Thong Lor 10, 225/11 Soi Thong Lor 10, Sukhumvit Rd., Khlong Tan Nuea, Watthana, Bangkok 10110 Thailand. It’s not a very long walk from the Thong Lo skytrain stop. According to the Bangkok Post, they have outlets at Siam Center and Central World. 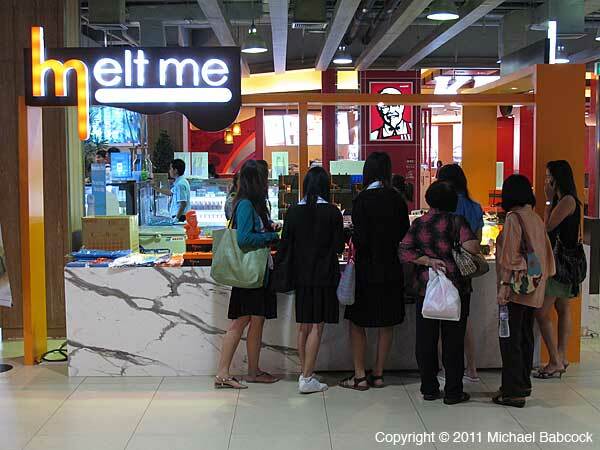 Here’s a blog from Hungry in Bangkok on the restaurant: Melt Me. 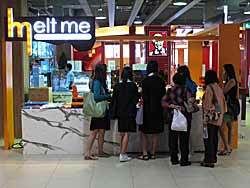 And here’s one from A Girl in Asia: Melt Me, Bangkok. How to buy a coconut at the store? 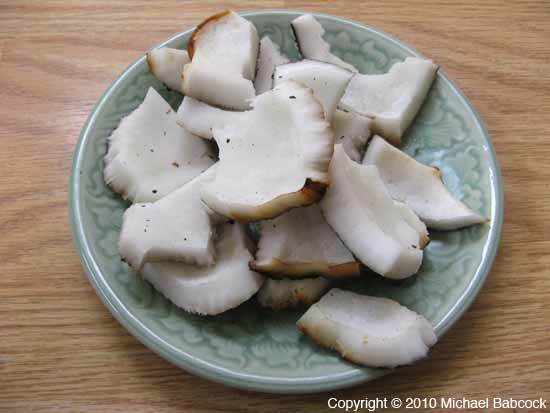 Most Americans know coconuts primarily as the highly processed, sweetened products they’ve had sprinkled over coconut cakes or in mixes for piña coladas. Neither is a fair representation of what fresh coconuts really are like with their rich and nutty taste and mild, naturally sweet flavor. Though supermarkets routinely carry coconuts, most people do not have the slightest clue of how to select one, much less what to do with it once they have brought one home. They try to poke holes in the eyes to drain out the liquid, then take a hammer to it to crack it open, sometimes accidentally jabbing or banging their own hands. After taking the trouble to get inside the hard shell, nothing is more discouraging than to find that the flesh has turned rancid. Such an experience is sure to deter a novice from ever bringing another one home, resigning herself to the packaged stuff on the shelf. But wait! You should give it another try. Here are a few tips to get you started again, keeping in mind that the rich, nutty flavor of a good, fresh coconut is hard to beat. 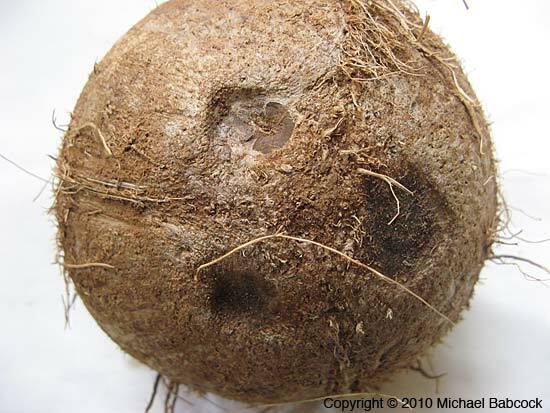 Unlike nuts such as almonds, coconuts are more delicate than most people realize and do not have an indefinite shelf life, especially after the outer husks have been removed. Without the protection of the spongy husks, the shells bang against each other in transport and often crack and develop leaks. The eyes on one end are also exposed and subject to puncture and air seepage, or mold growing inward. Air and mold entering the coconut make the rich flesh spoil quickly. That is why when purchasing a coconut, take care to choose one still heavy with juice. Shake it, and if it seems dry, chances are there is a crack or leak in the shell, or it may have sat on the shelf too long, the juice having all but evaporated through the thin membranes of the eyes. Check the eyes, they shouldn’t look dark or moldy. Though often sealed with wax to prevent leakage, this does not guarantee that it has not occurred. 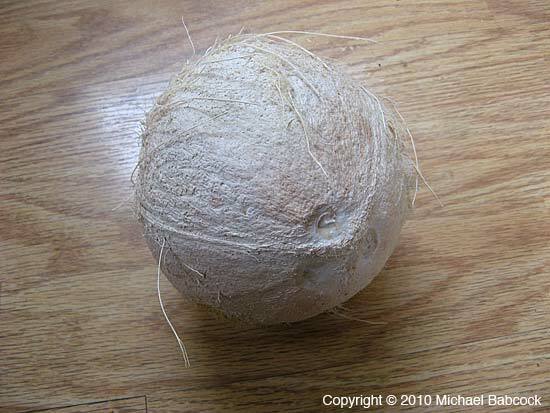 When looking for a coconut to buy, search first for a batch with an overall appearance suggesting freshness. If there are several that are moldy or cracked, try another store. From a fresh-looking batch, choose the best-looking one, and if you wish to be doubly sure, take home an extra as a back-up. 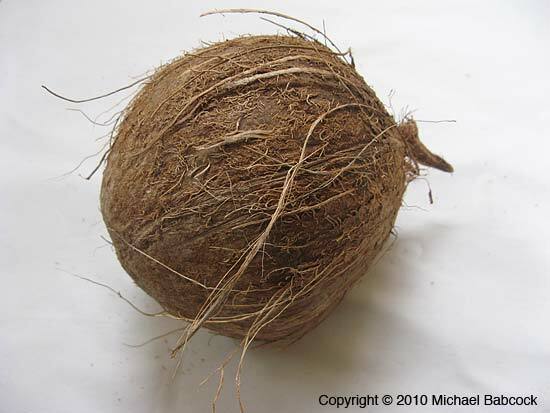 If you are not going to use the coconut right away, store in a cool dry place with good ventilation, or unwrapped in the refrigerator so that the shell does not become damp from condensation. Because the eyes are small and the surrounding shell thick and hard, draining the juice by poking holes in the eyes, as suggested in some cookbooks, may not be as easy as it sounds. The slow trickle may soon tax your patience. 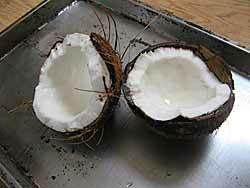 After draining, stick the whole coconut into a hot oven (400-450°) for about 20 minutes. Then cool sufficiently to handle before cracking it open into smaller sections. The heat of the oven would have loosened the meat from the shell, making it easier to pry out with a small knife, spoon or clean screwdriver. Cracking and draining the coconut before placing in a hot oven will prevent it from exploding, an experience you most certainly want to avoid! Peel off some of the brown skin if you wish. Cut into smaller chunks and shred or chop in the food processor to the fineness desired for making your Thai desserts. To try out your coconut skills, try Kasma’s Grilled Coconut Cakes (Kanom Paeng Jee). 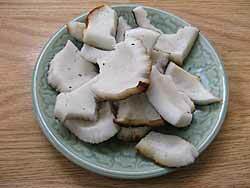 Kasma’s recipe page lists many Thai desserts using coconut or coconut milk. 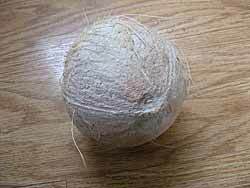 information on coconuts from Kasma. Michael’s article on How to Eat a Coconut a Day in Thailand. 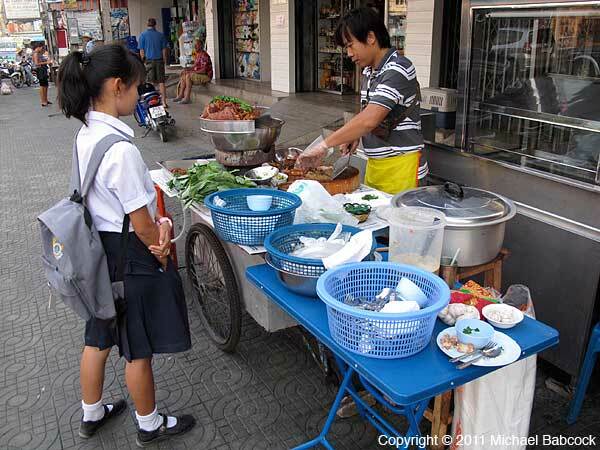 You are currently browsing the Thai Food and Travel Blog blog archives for March, 2011.